I was silly and just didn't go to bed last night. Nothing was preventing me, I was just too tired to get up off the couch and go to bed. You know, you tube videos, and meaningless internet searches, all because I just didn't have the energy or motivation to get up and go to bed. When I finally dragged my tired bones to sleep, knowing full well that today would be a difficult day, all my own doing. Oddly enough, today was actually a really good day! I was able to stay patient and calm with the children, and even enjoy them so much more than I usually do, despite it being an incredibly busy day. I had an appointment with my midwife today. The baby is still the wrong way. He is breach, and hanging out with his head just under my ribs. He loves to do little head buts which are ridiculously uncomfortable and also fill me with a longing to cuddle that sweet little bobbin in my arms. Beth was adorable while we were there, as usual. She asked first the nurse and then my midwife to check her tummy too. Christy (my midwife) is an angel and poked around on Beth's tummy, asked her if it hurt, told her that she looks wonderfully healthy but should probably eat some yogurt when she got home to fill her up with wonderful probiotics. I am so happy that by chance I found Christy 7 years ago. We stopped at Macey's on the way home, because when baby uses the bladder as a trampoline, pit stops become essential. It was fun being in my old stomping grounds. It was the Macey's down the street from where Jeffrey and I lived when we were first married. Beth thought it was the greatest thing, how big it was. She ran and ran and hid among the isles, and we basically had a wonderful game of hide and seek while picking up a yogurt drink for her. We picked up Faye from school, had lunch, and then despite the many tantrums Faye threw, and her insistence that she wasn't tired, the three of us all fell asleep and had wonderful 3 hour naps. I hate that it was necessary, but I also view it as a tender mercy that Faye was able to take a nap with me as well. I was able to sleep better that way, knowing that she was asleep next to me. When we woke up, Faye and I had a precious half hour before Keith got home and before Beth woke up. Faye has really been missing Mommy-Faye time, and so instead of cleaning up from lunch, we sat down at the table and colored. I put my phone far away from me, and just enjoyed her. And I loved it! I need to make time to do that more often, that's for sure. And then Beth woke up and the big kids went out to play, and Beth and I got to bond one on one. 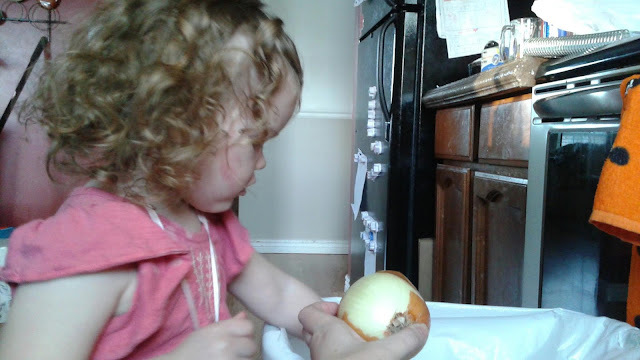 She found an onion and wanted some of it, thinking it was a fruit. Since I needed one for dinner anyway, we pulled the trash can over to us and I let her unwrap it. Like Christmas, it was. She would stop every once in a while, hold my face in her little hands, look into my eyes, and tell me that she loves me. That absolutely makes me fly. I remember thinking how much she makes me love being a mother. All of my kids do, really, but the toddler stage is my favorite because they are so cuddly and sweet and trusting. And they have more love than any other human being on earth! Keith and Faye have had a hard day today. Flying off the handle for no justifiable reason. Faye commented that Keith is almost always nice to her. He interpreted that as her saying he is mean. Faye didn't get to ride from the school to the house on her butterfly booster chair, so that made her break down in sobs, and the need to be loved and mothered has been achingly clear for both of them, today. Which is what I live for. I live for those crystalline eyes welled up with tears looking to me for comfort, fully confident that I carry the balm for which they seek. When they cuddle me because they are tired or just needing the comfort of a mom's arms. And that comfort was much sought today. We had a delightful curry for dinner, which was oddly enjoyed by all. The last time I made any type of curry, they complained and refused to eat it. I half expected the same reaction tonight, but was happy to be wrong. Dinner was full of laughing as we recounted stories of the kids when they were little. How they all dropped their forks when they were Beth's age. And everyone looked at Beth who was driving her fork along the edge of the counter like a train on precarious tracks. And then she dropped her fork. Again.We all laughed. Which started the "tell me about something funny I did when I was little!" begging. Dinner was so wonderful. And bedtime again. The gathering of clothes for school the next day. Making sure they have their homework in their backpacks and that the homework is finished, jammies, stories, and bed. But not without lots of hugs and cuddles and excuses, because to have a bedtime without the excuses would be a miracle indeed. Also, reading with Faye is one of the most difficult things I have to do. She gets so distracted by every. single. little. thing. It takes twenty minutes sometimes to read one page consisting of five words. I try so hard to be patient and encouraging, but there comes a point when I need to just take a break! I told Jeffrey after Faye was tucked in bed tonight that he has to read with her from now on. He is so much better with not being bothered by the constant interruptions. Sigh. I think he is okay with it, because his mind works a lot more like hers in that capacity. And now it is glorious bedtime. Which I have been waiting for ever since I woke up from that nap. But it was a wonderful day. I hope tomorrow can be as fantastic as today has been! Seriously our families are so alike it's so crazy!!!! Not last night but the night before I could not sleep at all! That never happens to me and I found myself still awake when the alarm went off to get the kids ready for bed, I HATED it! Haha I do not do well with not a lot of sleep and I've been so stressed, but I made it through the day by the grace of the Heavenly Father. Can't believe you did the same last night. Also my kids are the same and I am loving the toddler stage also and my littlest Lola does everything the older kids do and so when my middle child kisses my cheeks and then my forehead my toddler will do the same and she normally isn't a cuddler and has recently become more so! I just love it all!! I get it basically is what I'm trying to say. I swear you are living my life somewhere else in the world. My oldest was like Faye as well and I made my husband read with him also! He is a great reader now in 2nd grade and I can't believe how far he's come, from how much I struggled with him in kindergarten and 1 st grade! Some days are sweet and blissful others more challenging! Move to my town lol. Love that your day turned out to have precious moments and priceless memories. You deserve those!